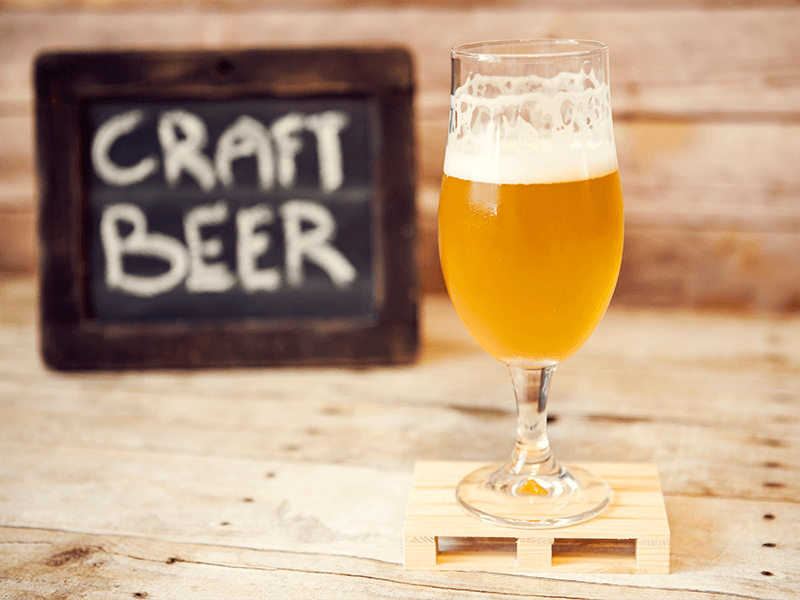 As you may know, craft beer is a beer made in a traditional or non-mechanized way by a small brewery. Perhaps, what we love most about craft beer is that brewers have a unique way of connecting with their customers. It is truly a bond that cannot be replicated. Even more, the enticing flavors and aromas in craft beer offer a rich reward for your palate in every sip. So, it’s no wonder that in recent years the American Craft Beer scene has hit a wave of popularity. And, with the majority of Americans living within 10 miles of a craft brewer, why not hop on the craft beer train this summer? Without further ado, here’s a breakdown of the craft beers you have to try. Trust us; your taste buds will thank you. Troegs Nimble Giant is a double IPA that is released once a year by Troegs Independent Brewing in Hershey, Pennsylvania. The double IPA boasts hints of grapefruit rind, pineapple, and honeysuckle notes with a hint of earthy forest floor. Nimble Giant pours clear with an orange color and white head. Additionally, this unique and tasty brew pairs nicely with a savory meal, such as chicken with roasted vegetables. This year, Nimble Giant was released on June 12th, and it is still available in stores throughout the Maryland region, making it one of the summer craft beers you have to try. So, snag a few bottles or cans before they’re all gone for a one-of-a-kind drinking experience. Yep, you guessed it; this unfiltered double IPA drops on September 4th of this year and will be available for purchase in 48 states. The Stone Brewing Company in San Diego, California offers year-round releases of their IPA’s, with two being released each season that reflect the flavors and styles of that particular season. Stone Enjoy pours golden and hazy with a creamy white head. The aromas include intense peach, tropical fruit, and citrus and it finishes with hop flavors and bitterness. It pairs well with many desserts, cheeses, and main courses including gumbo, carrot cake, and extra-aged cheddar. Interestingly, The Stone Brewing Company has gone to extensive lengths to ensure that customers enjoy the IPA within an extraordinarily short window of time (37 days to be exact). Thus, proving that there is no better time than right now to enjoy it. RAR Brewing is located in Cambridge, Maryland along the Chesapeake Bay and, ever since the summer of 2013, they have been producing well-balanced American and Belgian inspired brews. Nanticoke Nectar, a West Coast-style IPA loaded with aromatic Citra hops, is one of their most popular selling beers. And, what makes it stand out is the amount of malt in the well-balanced body. Nanticoke Nectar starts with citrus notes that progress into bold grapefruit and pine. Then, it finishes clean with a balanced, hoppy bitterness. The IPA has a hazy copper color with a thin white film for a head, and it pairs well with Cajun, Japanese, Indian, and Mexican cuisine. Luckily, this beer is offered year round in kegs and cans in stores and restaurants throughout Maryland. Try the local beer brewed by the local boys. Troegs Crimson Pistil is another IPA from Troegs Independent Brewing. At first sip, the flavors begin with sweet floral and hibiscus notes along with berry juice, wet hops, and some malts. Additionally, the IPA pours a reddish amber and a fluffy pinkish white head. Crimson Pistil compliments dishes such as fish tacos, jerk chicken, and watermelon. The only downside is that Crimson Pistil is a seasonal beer, available from mid-April to July in cans, bottles, and on tap. So, unfortunately, it may be too late to find it this year, but be sure to try Crimson Pistil next summer. Don’t forget to stop by Adam’s TapHouse and Grille in Edgewater this summer. Our Smoked Beef Brisket and Smoked Wings complement all of your favorite craft beers. Our Tender braised brisket of beef with Adam’s bourbon and brown sugar sauce is nothing short of a crowd pleaser. What’s a great beer without some great food?